Brickwork is needed in the construction industry for a number of reasons and professionals can be utilised for both the domestic and commercial market. By taking advantage of what an expert has to offer, you’ll ensure a job is completed quickly and efficiently. 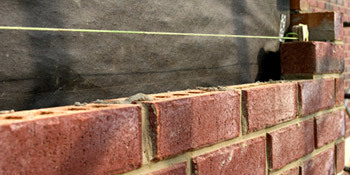 It can be a daunting process trying to find a bricklayer who is both competent and reliable in equal measures. With no previous experience to go from you’ll have to rely on word of mouth. We are all too aware of the horror stories many people in the UK have, with bricklayers not showing up after taking a deposit and unfinished work causing a heavy financial burden. With cowboy bricklayer builders, the excuses will keep coming and the work won’t be competed to a high standard. Which is why using our service will not only help you achieve value for money, but ensure the work is completed to an exceptionally high standard, on time. We have plenty of contractors on our books who have been independently vetted and references have been taken, commemorating companies and individuals on their work. Why would I need a bricklayer? Both are large installations and whether you’re making repairs, adding an extension or even building a garage for your property, you’ll need the services of a professional. For projects such as these, which will undoubtedly burn a hole in your pocket, it’s essential to get everything right first time. A strong border is essential for homes, commercial buildings, schools, farms and more. And when you think of strength and endurance, brickwork should be one of the first things to enter your mind. With resistance to natural weather conditions, brick is perfect to act as a border. If you’ve taken the decision to have a conservatory installed as a viable way to create space and light in your home, you’ll want to make sure you receive the best value for money. Many conservatory bases have brickwork for that extra strength and the uPVC, hardwood or aluminium frames are then fitted above, creating the aesthetic appeal. If you’re in need of a bricklaying company for whatever reason, you’ve come to the right place. With our service you can receive up to four FREE quotes from local, vetted and reputable professionals in the trade. Just complete our quick quote form below and hear from the experts in just minutes. Project: Repair a wall or build a new wall. Size around 15 metres x 1 metre. Project: Build a breeze block wall between myself and my neighbour .No problem with access , and rough render . Build a 3 course high breeze block wall ,reinstate existing feather board fencing on top . Project: Extend garage to the side, and back, with roof and doors front and back. Project: Great, so where are you looking to have the work done? Build Wall Garden wall, attached to house at one end. Approx 12ft long x 8ft high. Project: Great, so where are you looking to have the work done? Replace Missing/Broken Bricks Small area on side of house needs replacing / repointing as disintegrating. Very small job, maybe 12 to 20 bricks. Initial contact was almost instant and he was very professional sounding. However, he never contacted my tenant to arrange to view the job required. As yet have only met with one and not yet received an estimate. I would have no hesitation recommending this company to others as everything about them was five star. They helped me find a tradesmen that I was looking for . we were finding it very difficult to access tradesmen for the work in hand so thankyou quotatis you made it so simple. Left me with the necessary information .